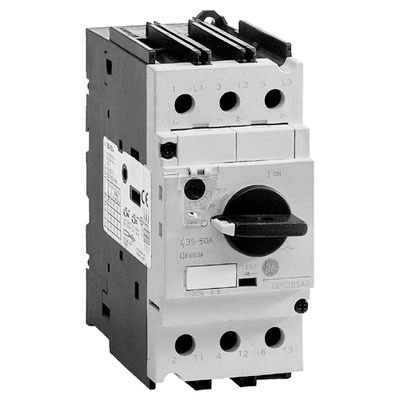 GE Industrial 3-Pole Type GPS2 IEC manual motor starter has a voltage rating of 600-Volts and withstands current up to 32-Amps. The Class 10 starter has a maximum load bearing capacity of 2 hp at 115-Volts and 5 hp at 230-Volts in 1-Phase connection and 10 hp at 200 to 208-Volts, 10 hp at 220 to 240-Volts, 20 hp at 440 to 480-Volts and 25 hp at 575 to 600-Volts in 3-Phase connection. This high-interruption starter has interrupt rating of 65-Kilo-Amps at 240-Volts, 50-Kilo-Amps at 480-Volts and 10-Kilo-Amps at 600-Volts. The IEC manual motor starter meets UL/cUL, CSA, CE and IEC standards.